Vivian Slegewick has chosen to host her High Tea party on May Day, a traditional day of festivities throughout the centuries in her hometown of Salt Hill, England. 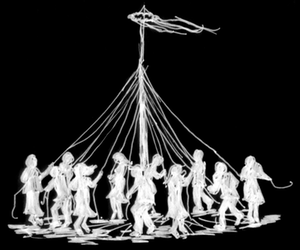 This day holds fond memories for her in that the townspeople of Salt Hill held traditional celebrations that included Morris dancing, the crowning of a May Queen, feasting and dancing around the Maypole in the centre of the town. May Day customs celebrated springtime fertility and the end of the planting season. When Vivian first came to North America she was surprised to learn that May Day was known as “International Workers' Day” and was a celebration of the social and economic achievements of the labour movement rather than a day celebrating the arrival of summer. This commemoration of May Day was chosen in 1884 when the National Federation of Organized Trades and Labor Assemblies in the United States decided to call for a general strike on May 1 to enforce demands for employers to observe the eight-hour work day. She also remembered that in 1958 the U.S. Congress designated May 1 as “Loyalty Day” due to the day's perceived appropriation by the Soviet Union. Today people around the world use May Day as a day for political protest, which she feels is a shame. Vivian will share fond memories of some of the pleasant activities of May Day in England at her Tea Party on May 1.